Ever wanted to rant about that someone you just can’t stand? Overwhelmed with too many feelings? 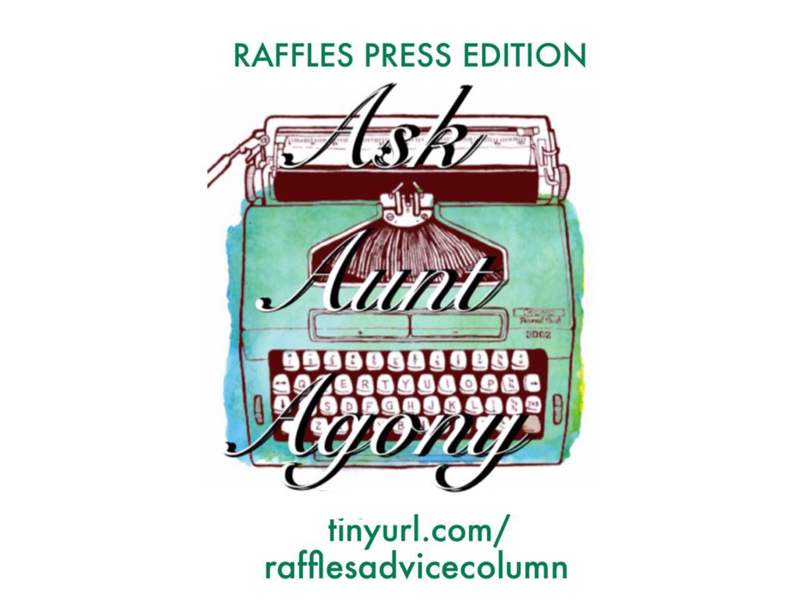 Check out Raffles Press’ new column, Ask Aunt Agony and Uncle Upset, and our resident Aunties and Uncles will be glad to help you with your Rafflesian troubles! Submit your confessions to tinyurl.com/rafflesadvicecolumn and we’ll give them our best shot. Common Tests are coming so soon :( I’ve been failing everything, I don’t know how to score well, but my classmates seem to be doing fine? Why am I the only one who can’t seem to do it :( How do I study smart and calm down?!?! After getting back an Economics essay that I failed, I genuinely get how you feel. It’s certainly demotivating to be alone in your situation among your peers, and all the more so because you look like the ‘odd-one-out’ in your class – and not for good reasons either. It must be especially difficult being alone in this when you’re so far from where you think you ought to be. Often, when we’re in such a position, we’re saddled not just with the feeling that we’ve failed to live up to others’ expectations, but also as if we’ve failed to do so for our own. But rest assured that this is no way an unusual setback – we’ve all felt that way at one point or another. Take things from another perspective: there are many valuable lessons you can learn from this. Look at what’s happening around you with optimism: although not doing so well for your test is a downer, you’ll also have great room to improve by leaps and bounds, and you certainly have time this holiday to catch up on your weak areas! For now, here are some tips to pulling through your Common Tests. Admitting that you have a problem is a vital first step to helping yourself. In this respect, you could get started now by seeking help. There are many avenues available, even outside of school, to help a budding student like you. First off, it’s worth identifying any areas you’re lacking in, such as your study methods, time management, understanding of concepts, and so on. Sometimes, an inability to perform can even be attributed to reasons that we think are trivial, such as examination stress (the inability to perform well because of anxiety during examinations). Don’t feel demotivated or turn on yourself! It’s part and parcel of student life to make mistakes; even if the problem seems to lie with yourself, there’s no shame in that. 1) Take out your past assignments, and understand your errors. Is there a common type of question that you always make errors in? Do your teachers keep giving you the same comments? It’s no coincidence if your History teacher writes down ‘example?’ on each of your paragraphs. Identify your past problems to prevent them cropping up in the future. 2) Seek to clarify issues through your lecture notes and your own notes. If that doesn’t work out, there’s a wealth of online information. The school itself offers an abundance of resources that you can tap on – lecture videos are available on Discovery if you need to refresh your memory with the sound of your lecturer’s voice. 3) Learn from the best – consult your classmates and tutors! Start seeking help now – the longer you wait, the worse things could get. If you’re scared, try speaking to your peers. They’re in the best position, which is to say, your position, and may have some tips for studying that you looked over. Don’t be afraid to ask for help or discuss what you learn in class – there’s nothing wrong with taking your education seriously. Anyone can memorise heedlessly and copy-paste from their recollection onto their answer scripts, but it takes some forethought to be able to manipulate your content at a higher level than that required for the A Levels. Fortunately, quality studying is a habit that we can foster eventually. There are already many informative write-ups out there that address how to achieve it with ample tips and tricks, and in fact, our writers previously published a specialised guide to studying for JC students; still, we shall adjourn to share some universally important principles you should keep in mind. Target your weakest topics especially, and try out the most challenging questions (preferably with explanations you can refer to). Maximise your studying time on areas that need the greatest improvement, and don’t bother with questions that, while easy, are the run-of-the-mill type even if they’ll give you a much needed ego boost! Those won’t help you make the most out of your effort. In other words: love your subjects. When you appreciate the theory in the wider context of the real world, you’ll find the beauty in what you study. Don’t groan about how you’ll never use H2 Mathematics to order restaurant food, and instead acknowledge the insightful lessons the subject has taught you about logic and reasoning. Be thankful for what you learn and how it has illuminated your understanding of the world.On the flipside, what you learn in the real world too can be applicable and useful for your subjects. That tidbit of news you catch on the TV? Use it for your GP exam. Finally, why not start off your mugging session with your favourite subject? Reading that literature poem can ease you into the process and make doing that mathematics tutorial just a bit easier. The A Levels are not forgiving to those who devour model answers without authentically knowing what they’re writing about. You can do that, but you also have to get to the root of your knowledge and understand the why in addition to what. In the case of “I don’t know what I don’t know,” start with your most rudimentary concepts so you have a good foundation for harder ones later on, then move on to higher-order thinking. Keep finding links to the basic ideas relevant to harder topics.Always know why you’re making effort in a certain area. Don’t, for instance, memorise case studies or surveys by random for GP; understand that these examples come under certain points or claims you’re making in your essay. Now’s not the time to aim for perfection. This is a piece of advice specific to just J1s taking their first Common Tests, but it rings true – it’s early days yet and you’ll make mistakes, but now is in fact the best time to make them. We all deserve to cut ourselves some slack despite our blunders, and it’s no less true for you. Moderate your expectations, for now. Oh, time is one of your biggest enemies. After all, would you be panicking if you had forever to prepare for your CTs? Time management is an area your educators have harped on about countless times by now. Unfortunately, we often neglect it. You know that it’s important, but you probably haven’t known what it’s like to see an improvement in your grades just from limiting your time on the TV, and that’s probably why you may not actively heed their words. Well, what you can do is start small: say shoo to your distractions. We unknowingly while our time away on Whatsapp and other mobile apps these days, so install applications to restrict the usage of your phone. Time management controls are self-explanatory, but there’s no one-size-fits-all glove for them because everyone has different distractions, so we advise you to deliberately turn away from what diverts you from what’s important at hand. Usually you know what distracts you, so the next step is to simply transfer this into action such that they don’t have to (eg. miss a few social outings, use the computer less often). Remember: It’s alright to unwind – as a reward to yourself, after doing work. On the other hand, it’s undeniable that CTs are coming up very soon. If left unchecked, your worries about them will continue to be a source of utmost distress, which may well cripple any progress you can make on self-improvement. It is thus crucial to combat your immediate anxiety. One way to calm your mind is to, as they say, get your life into order so entropy won’t be able to have its way with you! A key way to do this is to observe your CTs from a bird’s eye-view; don’t focus on the immediacy of your problems. Following that, organise your scheme of action clearly for the upcoming CTs. List all the most urgent things you have to do systematically, as this helps in narrowing your issues down to just a few pressing ones, and when you do so, your difficulties won’t seem as intimidating as before. Motivating yourself (with the right reasons of course) is key to ensuring that you put in a sustained effort for all your CTs. Take a look at a specimen exam paper and think: you are going to have to face this in a month’s time sitting in a freezing hall for a gruelling 2 hours and that, right now, truthfully you may have no idea whatsoever how to attempt it. On the bright side, though, you have ample time to study. The question then is: will you start studying now or wait till the week after to panic? Finding something that helps maintain your determination (a countdown to CTs, a study plan etc) will ensure that your studying remains effective and meaningful. If you have any queries or concerns related to the Aunt Agony/Uncle Upset column or its confessions, please direct them to press.raffles@gmail.com, with the title ‘Questions about Aunt Agony’.